This is the second tutorial in a series. The previous tutorial is: Second Life Mesh Clothes Blender 2.6 Setup 2012 Tutorial. The next tutorial is still a work in progress. The direction I’m going with tutorial is toward making clothes and weight painting. But, this tutorial will provide information for those building both objects and clothes. I am limiting this tutorial to just the modeling and the tools we need for making the model and the lower poly models we need for Second Life. This is not your standard tutorial. There are loads of modeling tutorials. 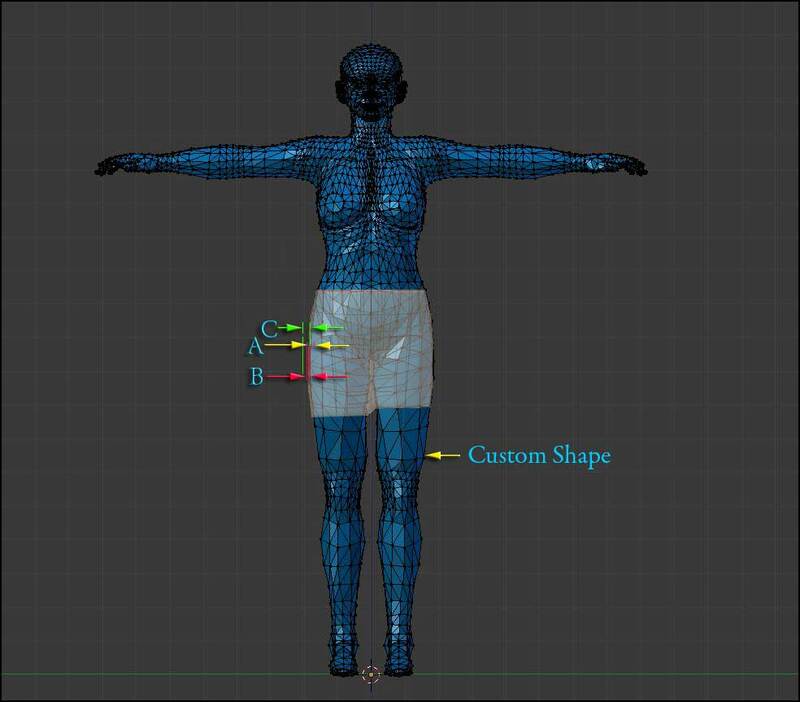 Making avatar clothes is a special type of 3D modeling. There are a number of tricks to be learned, especially for making Second Life® clothes. I’m going to focus on the things I had a hard time figuring out how to do. I’ll lay this tutorial out with indexing so you can quickly find the various tricks. I need that because I tend forget a step here and there and need to look it up. Page 1 – First Decision – Which shape to use. Page 1 – Deformer – What it does. Page 2 – Modeling – Start the modeling tools. Page 2 – C-Select – A better select tool. Page 2 – Redoing Topology Trick – Snap with a good video. Page 2 – Snap – Details on using snap. Page 3 – Scaling – How to use Alt-S scaling. Page 3 – Shrinkwrap – How to use shrinkwrap. Page 4 – Triangles vs Ngons – Getting into Ngons and Bsurface. Page 4 – Bsurface – How to use Bsurface. Page 4 – Grease Pencil – Needed for Bsurface. Page 5 – Reducing Poly Count – Needed for LoD’s. Page 5 – Dissolve – Tools for reducing poly count. Page 5 – Using Images – How to use pictures and images to guide your modeling. Page 5 – How to Model – Some of the Second Life requirements. Page 6 – How to Model – The outline. I hate slow paced, rambling video tutorials. I’ve found some that are pretty good. I’ll include those where appropriate. After them I’ll add explanations. Sometimes they leave out the most basic but necessary steps. Even after a couple years of using Blender I’m going: how did they do that? I hope by the time you are here you’ll have decided what to design, which is your artistic and creative decision. The first decision I can help you with is in deciding which base model you will use for a basis of your creation. If you are really new to Second Life® mesh clothes, you may have missed the debate on the in development Mesh Deformer and base models. Read The Great #SL Deformer Debate. Your first decision in building a model is to decide which model to design around. Your choices for now are the Standard Sizes, the Default Avatar Shape, and custom shapes. A major factor in deciding which base model to use is an understanding of what the Deformer will do when it is implemented. So, let’s get that explained. The idea behind the Deformer is to adjust the mesh to conform to the appearance sliders. Breast, derrière, and similar size settings (aka body fat) are handled by the Deformer. A calculation is made by the Deformer to get the distance from the Default Shape to the mesh object you design. When you wear the designed mesh that calculated distance is used to calculate a position from your current shape for the designed mesh. You will have a choice to set the mesh to deform or not. If you build for your personal custom shape, assuming it is significantly different that the Default Shape, and DO NOT use the Deformer then your clothing item will fit as you designed it. However, if you deform it, you’ll find it no longer fits. Look at the two images: #2 and #3. The Default Shape is used to calculate the distance ‘A’ to the skirt. It is calculating a distance for each vertex in the skirt. In the second image (#3), I show designing a close fitting skirt for my custom shape. The distance ‘A’ is the same distance ‘A’ in image ###. The distance from the same vertex in my skirt to the custom shape is ‘B’. If I designate the mesh to NOT deform, the skirt will appear on my avatar at distance ‘B’. If I designate the mesh is to be deformed, things get a bit more complex. The Deformer calculates distance ‘A’ using my mesh and the Default Shape. It then uses that offset distance with my custom shape to create the larger than intended offset ‘C’. You can see the green line falling outside the red dimension lines. The plan is to build for custom shapes and not use the deformer. For clothes that need to fit the most avatars of various shapes use the Default Shape and the Deformer. If we get a choice of base shapes, we’ll build for those too. If you have a small offset on the Default Shape, the Deformer will make a small offset on all shapes. Hopefully that is clear enough you can make a decision. As for how to model things, it makes no difference which you decide to use. The decision only affects how the final product fits. This entry was posted in Clothes Skins Etc, Content Creation, Mesh, Second Life and tagged Clothes, Mesh Tutorial, Tutorials. Bookmark the permalink.